One more first for the Rosetta mission… sounds of Philae landing on Comet 67P/Churyumov-Gerasimenko. 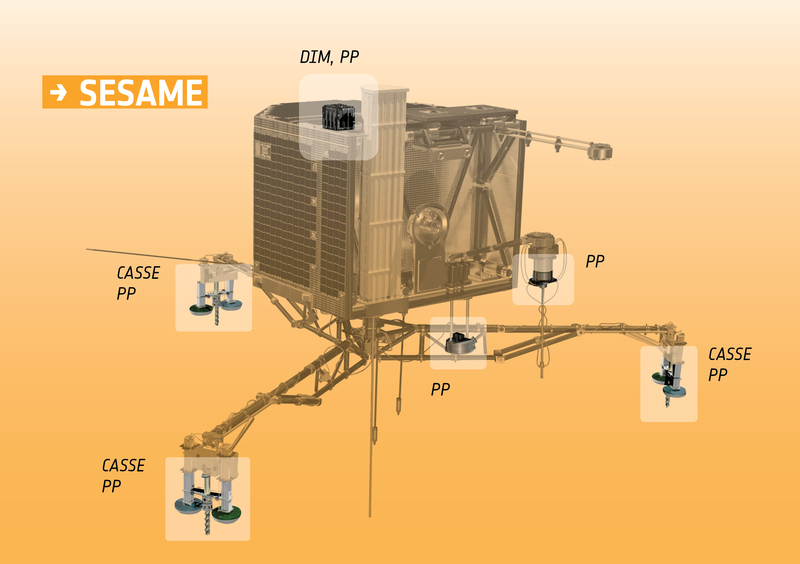 The SESAME-CASSE instrument sensors on the feet of the Philae lander recorded the sound at the moment of contact with Comet 67P/Churyumov-Gerasimenko. “This is exciting because it is completely new to us. We did not expect this and we are still working to understand the physics of what is happening,” says Karl-Heinz. The sonification of the RPC-Mag data was compiled by German composer Manuel Senfft (www.tagirijus.de). 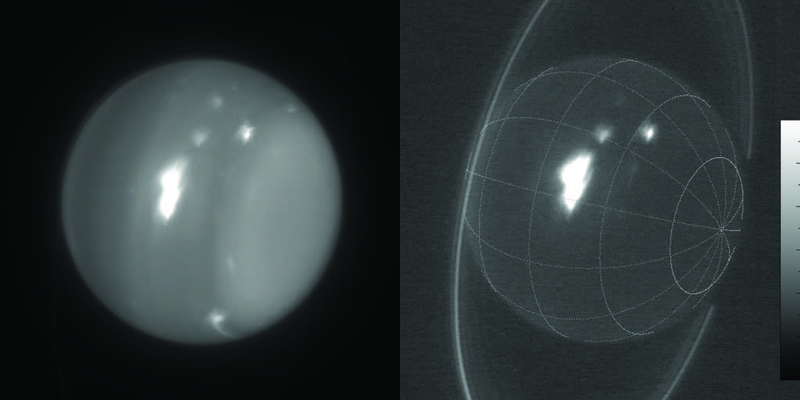 The planet Uranus is usually relatively calm when compared to its other companion gas giants in our solar system. Up until recently if you aimed a telescope at the distant planet you would have just observed a bland and hazy blue-green looking body without a whole lot going on. However, lately several extremely bright and large storms have been erupting around the northern hemisphere, and 7 years later than its closest approach to the Sun when astronomers would expect any activity to occur. Some of theses features are now even bright enough to be visible to amateur astronomers with a telescope, and this unusual activity has now sparked great interest in the unusual planet. It is now an active topic of research to understand these new phenomena since these wild storms were first discovered by astronomer, Dr. Imke de Pater, of the University of California, Berkeley. Watch the Rosetta Comet Landing LIVE NOW! Tomorrow, Nov. 12, may mark the first time humans have soft-landed on a comet. If this is successful it will be courtesy of The European Space Agency’s Rosetta spacecraft which is currently orbiting Comet 67P/Churyumov-Gerasimenko as it speeds through space. 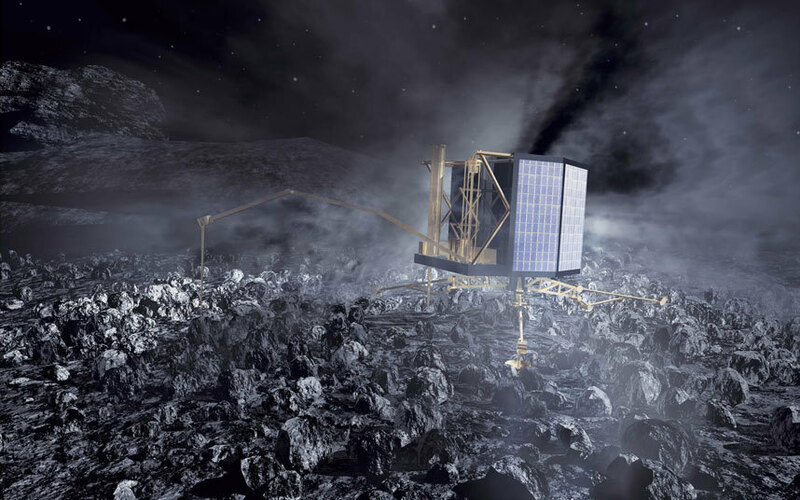 Rosetta will release a lander, called Philae, down to the comet’s surface tomorrow while three different space-focused organizations host Rosetta webcasts for all to watch. The Gaia Satellite was launched on December 19 of last year. It’s mission: to chart a 3D map of the Milky Way Galaxy by surveying more than 1 billion stars. Even though that’s just 1 percent of the stars in the galaxy, its goal is to make the largest, most precise map of where Earth dwells by observing the position of these stars 70 times over five years. Among other things, this could result in the discovery of up to 70,000 additional alien planets.